Introducing ghd Curve | Curls that lasts as long as you do.. I'm literally so excited to bring some exciting news for all of you who just love to have a good hair day... today ghd have officially launched a whole new product range and are officially entering into the world of curling tools in the form of ghd Curve! As a ghd employee I've known about this exciting news for some time now, but obviously couldn't tell a sole. For anyone who knows me, they'll know just how passionate I am about the company I work for, so to be entering into a whole new product range is big news for me, for the account that I manage, and obviously ghd as a brand. I've struggled to refrain myself from screaming this to the top of my lungs, so I'm pleased that as of today I can finally talk about ghd Curve! What is ghd curve? Well it's four new curling tools, two wands and two tongs. They're simply divine and create the most gorgeous curls within seconds. Not only do they look amazing, they're the easiest curling tool that I have ever used, literally anyone can pick one of these up and create a look with so much ease! 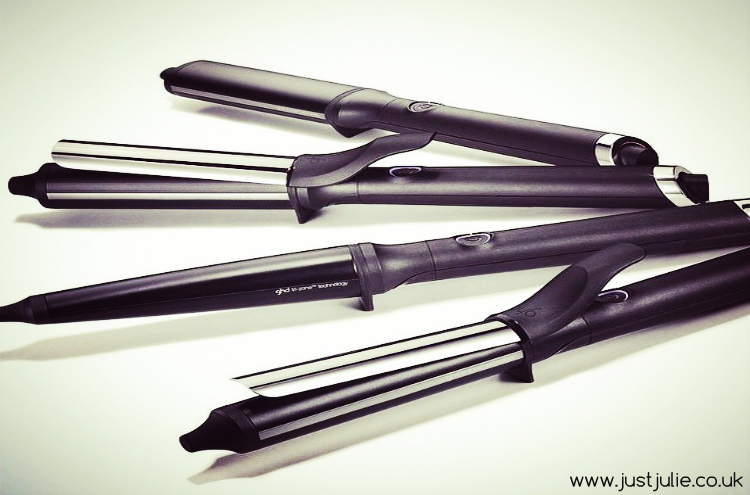 Because ghd Curve is only 185 degrees (the optimum temperature for all hair types) these are so much friendlier and healthier for your hair. Again please click on this LINK for a full explanation of the technology and how hair reacts to heat. ghd Classic Curl tong- for those who like a classic tighter curl. ghd Soft Curl Tong - For those who like a big bouncy curl, think Cheryl Cole. ghd Creative Curl Wand - For those who like to be able to create any kind of curl they desire, also the best tool for that messy festival look. ghd Classic Wave Wand - For those who love the red carpet, glamorous waves. All of the tongs and wands come complete with a cool tip on the end, which means you can use two hands and not burn your fingers! They all come with a built in safety stand, so you can rest them on your dressing table and not worry about burning the surface! They also come with the built in 30 minute sleep mode and universal voltage! At the moment all four come with a gorgeous black and rose gold heat resistant roll bag and mat as a free gift with purchase and this is my favourite gift with purchase to date! I'm not sure how long that offer is on for though! I wish I could share some photos of the looks you can create with these but my stock has only just arrived and any photos I do have aren't the best quality image, BUT be sure to check out my Instagram, as I'll be posting photos on there. Over the coming weeks I'm going to be doing a feature on each one, showing you different kinds of looks you can achieve, along with how to photos. As a ghd employee, a lover of hair and a beauty blogger, this is the most exciting product launch so far this year for me! I urge everyone to go visit your local John lewis branch that has a ghd counter or any of the Selfridges stores and go ask for a free demonstration, I promise you, you'll be as wowed about ghd Curve as I am. Your be surprised how quickly these curl your hair (each curl is formed within seconds) and amazed at how long they last in your hair! * This post was NOT sponsored or endorsed by ghd. All opinions are 100% my own and I have wrote this based on the fact that I love these and couldn't wait to tell everyone about them! Now that the secret is out I can finally breath!! !